In spite of the ice on the pavement at Skavsta airport, it was forecast to be pleasantly warm day, hopefully we would be able to find some slushy snow to ride on. Sadly our planned SkiBiking at a nearby resort had to be cancelled due to them refusing permission to use skibikes, a familiar story then. 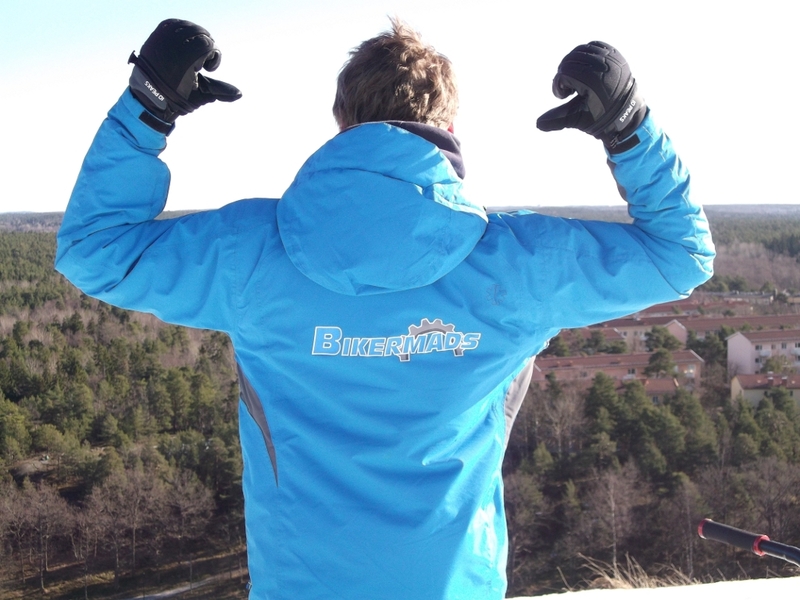 Instead we were heading for a tiny ski station in central Stockholm, an hours drive away. Tommy and I chatted about the skibike business and generally talked shop the whole way. Tommy was modest about his English skills, but understood my nuances of language very well, he also exudes "Nordic Calm" and I suspect would make an formidable poker player. In the back of the car were 3 skibikes to play with. 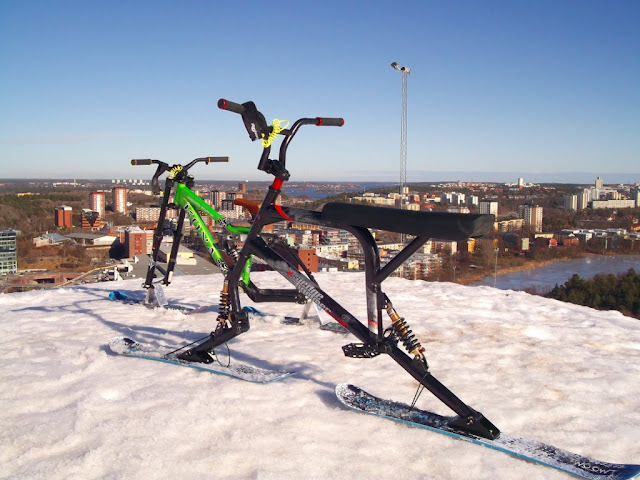 There were 2 examples of the SledgeHammer Freerider and a BikerMads conversion of a Kona Stinky. First up, I tried out a standard SledgeHammer Freerider, from the Austrian manufacturer who are now selling the cheapest ready made skibikes in Europe. It had an instantly recognisable feel, softly yielding and bouncy, close your eyes and you could be fooled that you were astride a Brenter fat boy, but with footpegs. Please note that The SkiBiker SkiBike Blog does not endorse riding skibikes with your eyes closed. The presence of many cycle derived parts, means that upgrades to suit your personal taste, such as; higher spring rates, better damping, alternative handlebars, etc. should be quite economical. 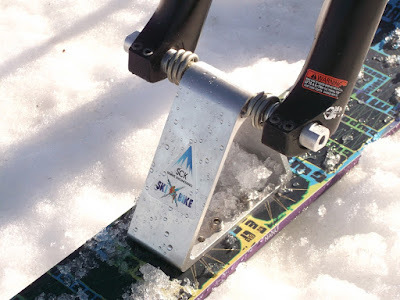 It was lighter than the burly construction would suggest and I found assembly to be straightforward thanks to quick release fittings for the skis. The ski levelling arrangement by high tech rubber bands doesn't exactly inspire confidence, but I am assured that BikerMads haven't broken any yet. However Tommy did feel that the standard skis supplied are quite thin for off piste riding and had a second SledgeHammer fitted out with trick powder skis for our appraisal. With the limited snow available it was hard to assess the difference, but as you would expect it was a bit more skiddy on the hard pack, but came into its own drifting out pleasurably on the slushy stuff. Tommy drew attention to some subtle design nuiances, such as the single tube front fork and rear tube design; these make the SledgeHammer skibike ride brilliantly in deep powder snow, due to the lack of drag that conventional mountain bike twin tube forks and rear triangle create. Next I rode a BikerMads Kona Stinky conversion, fitted out with aggressive looking Marzocchi twin crown forks, Fox shox at the rear and skis and adapters branded as SCK SkiXBike. These adapters are so very close to the original Winter X Bike / Alpine SkiBikes adapter and are produced by a Russian manufacturer. A potential law suit for pattern infringement in 5,4,3,2,1. My goodness, this combination felt planted, whereas the SledgeHammer felt squidgy and spongy this thing tracked solidly. It inspired confidence and even on virtually sheet ice still held an edge. If you get the impression that I liked this skibike, you would be correct, I didn't want to stop riding it and felt it could go a 1000 miles without ever boring you. Of course, even sourcing used parts on eBay and not costing in the time taken for DIY construction; the frame, forks and shocks combo alone, would be the best part of £500, add the kit and sundries would make this an £1100 machine, double the price of the bargain SledgeHammer. My only gripe with the conversion kit was the rounded stunt pegs, they soon become covered in ice and the knurled finish provided no grip at all, my foot slipped off at least once leading to an interesting new trajectory! 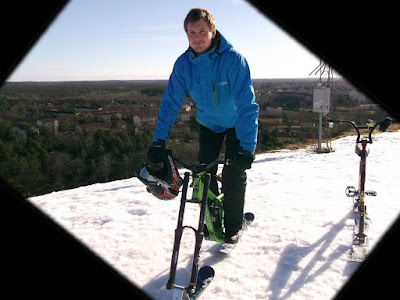 In conclusion, I could see the SledgeHammer as being the ideal beginner / hire shop skibike, friendly and forgiving for the first week of mile building, confidence inspiring skibike rides. Wheras the BikerMads Kona Stinky conversion would be geared towards the higher intermediate rider wanting to go that bit faster and trading off some fluffiness for precision, stability and overall control. My bed for the night was to be found at the A Marican hotel / hostel. The very word hostel has unpleasant associations for me, I once spent a week in a Youth Hostel in Edinburgh crammed full of odd balls, 15 to a dormitory and rocked to sleep every night by the furious masturbatory habits of the bunk mate nested inches below me (true!). Luckily, I am in the hotel side of the A Marican, in a basic single room with en suite sink with toilets and shower down the corridor. Not the Savoy admittedly, but all clean, simple and sturdy, much like a 1970s Volvo and costing a frugal £40 per night. A ski slope in the centre of Stockholm - How cool is that?